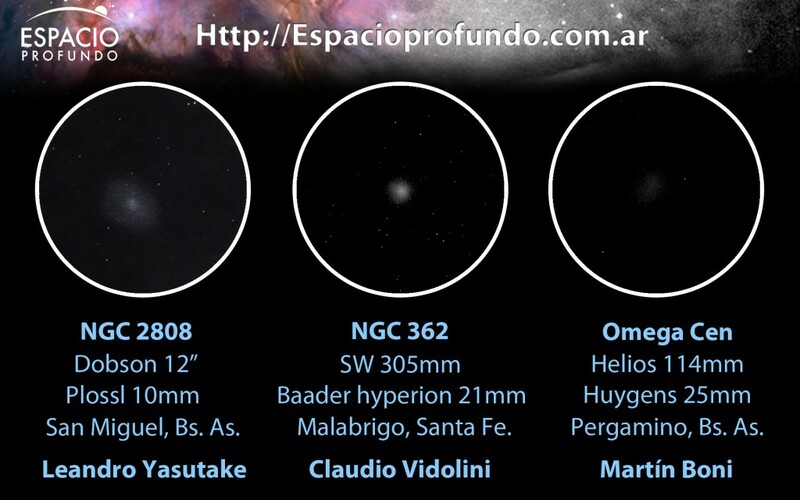 Hi ASOD, in my country there are not a good average of cloudless nights, and that to say of my city, however the weather of January and February has left draw these sectors of south sky with my binoculars 10×50. 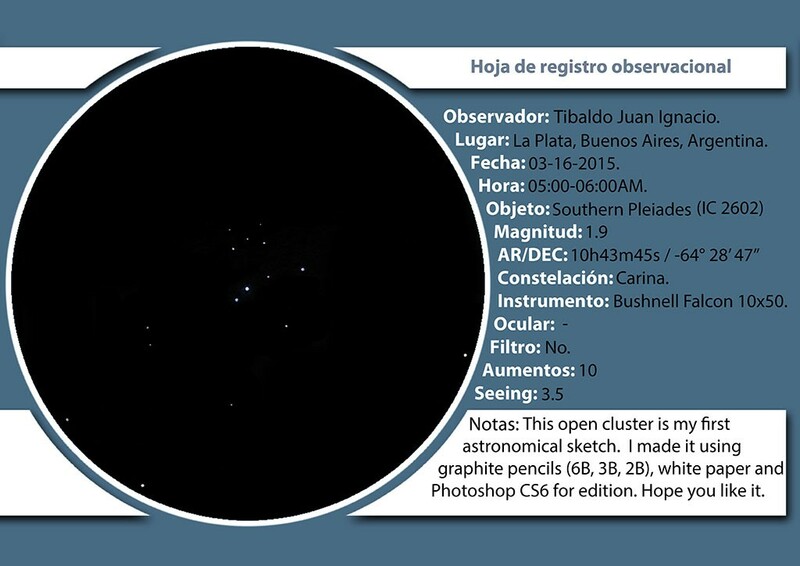 Hola ASOD, en mi país no hay un buen promedio de noches despejadas y que decir de mi ciudad, sin embargo el clima de principio de año me ha dejado dibujar estos 4 sectores del cielo sur con mis binoculares 10×50. 1. 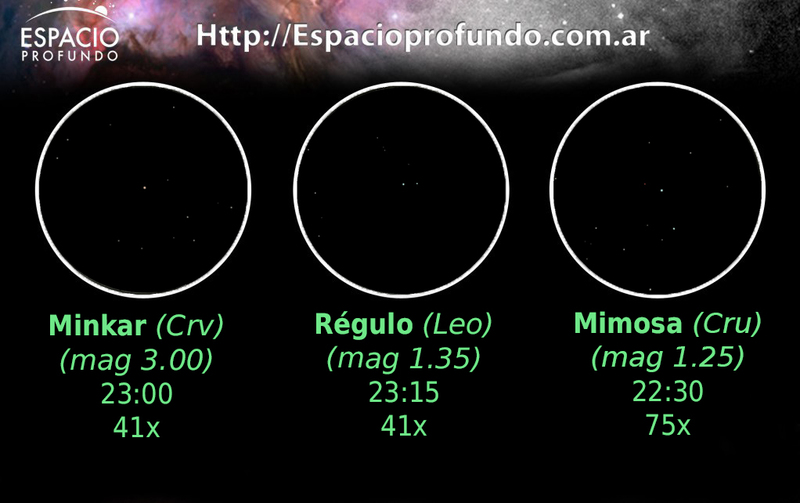 Crux: 23 feb 2015, 06:7 UT. 2. Lambda centauri: 14 jan 2015, 07:58 UT. 3. 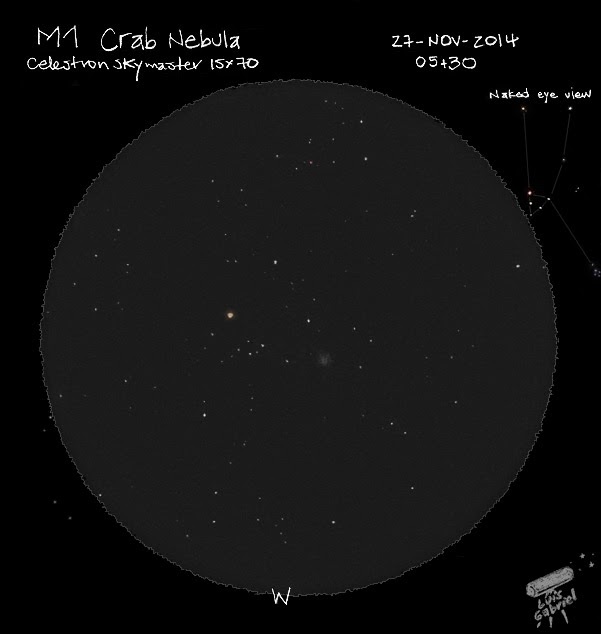 Eta carinae: 12 jan 2015, 07:46 UT. 4. 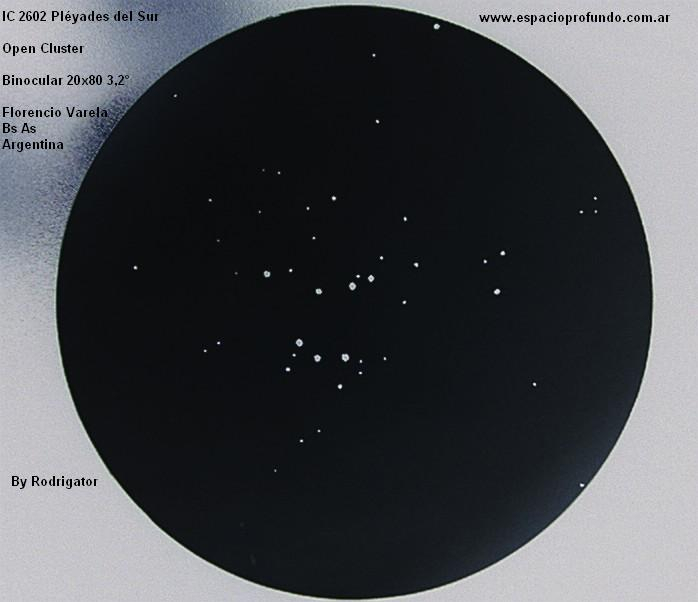 Pléyades del sur: 07 jan 2015, 07;32 UT. Media: Graphite Pencil- 2H, HB, 2B, PS invert. Optical instrument: Celestron Binoculars 10×50. this are me first contribution, I hope you will enjoy it. Hello guys! 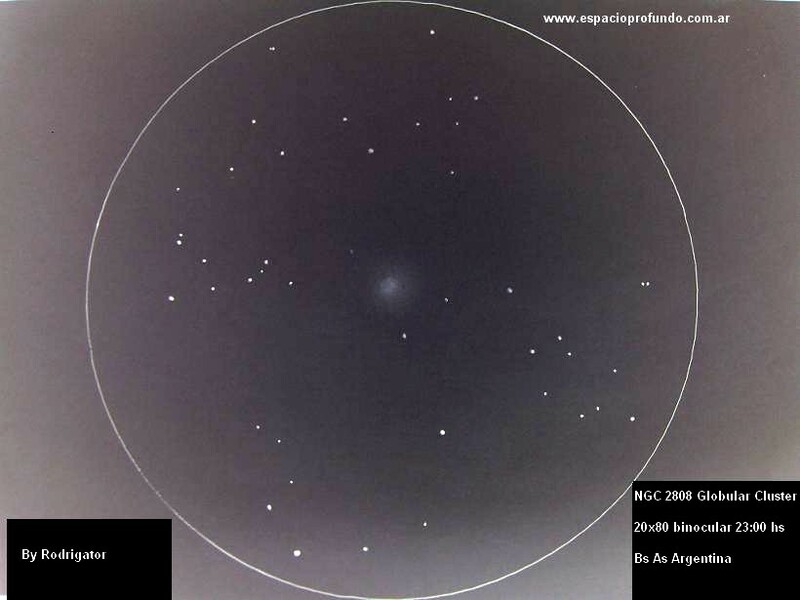 Here I send my sketch of IC2602 Pléyades del Sur. 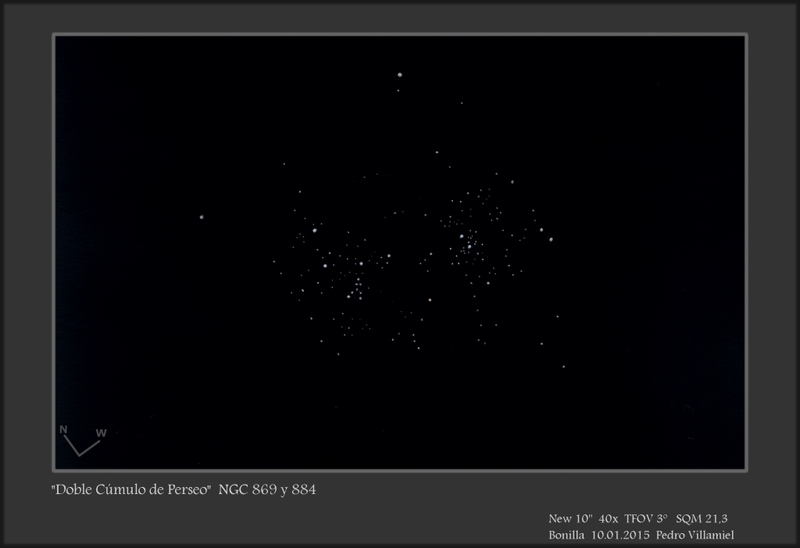 The double cluster in Perseus has always been a challenge for me. But when I came across an impressive dark sky, I did my best and this is the result. Telescope: Celestron nexstar 5′ S/C. Este es el segundo dibujo que hago de este cúmulo abierto. Decidí volver a retratarlo bajo condiciones distintas de observación, esta vez había Luna llena y la idea es comparar ambas condiciones de observación. El seeing no era muy bueno, la atmósfera presentaba turbulencias que desenfocaban la imagen por momentos. El dibujo fue realizado con papel y lápiz, posteriormente procesado en Photoshop para invertir los colores y simular el efecto de resplandor que genera la luna en el cielo. 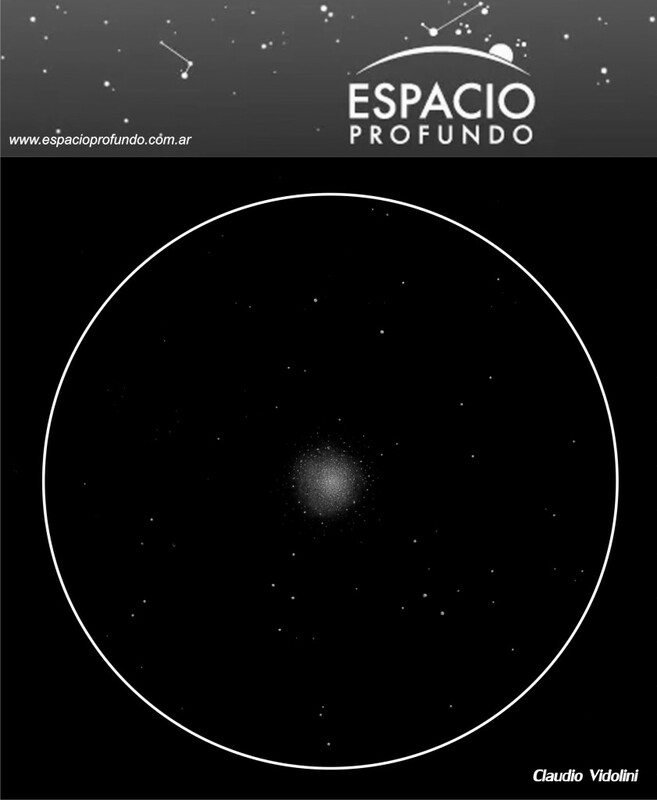 Además agregué algo de color a las estrellas, tal como las veo a través del ocular (huygens 25mm), pero los colores se atenuaron un poco al fusionar una capa celeste para dar el tono de luz de Luna al fondo. En realidad deberían verse los azules y el rojo de la estrella central más vivos. 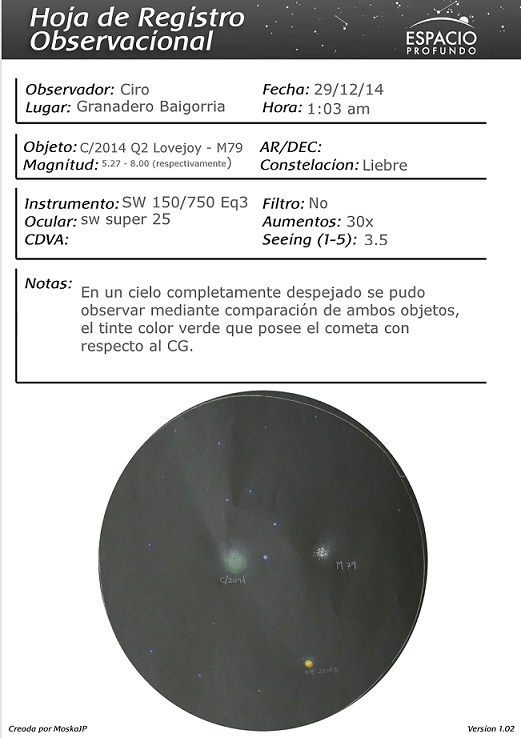 El equipo que utilicé para realizar el sketch es un telescopio reflector marca Helios, de 114mm de apertura y 900mm de distancia focal. El dibujo fue realizado desde Pergamino, Buenos Aires. 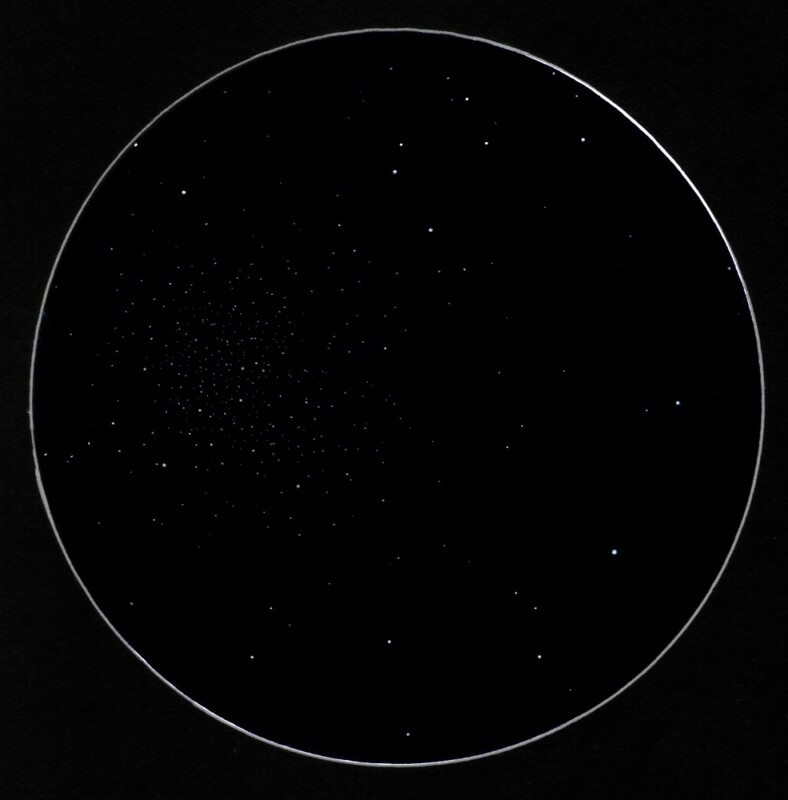 This is the second drawing I do this open cluster. I decided to portray under different viewing conditions, this time there was full moon and the idea is to compare both conditions of observation. The seeing was not very good, the atmosphere had desenfocaban image turbulence at times. 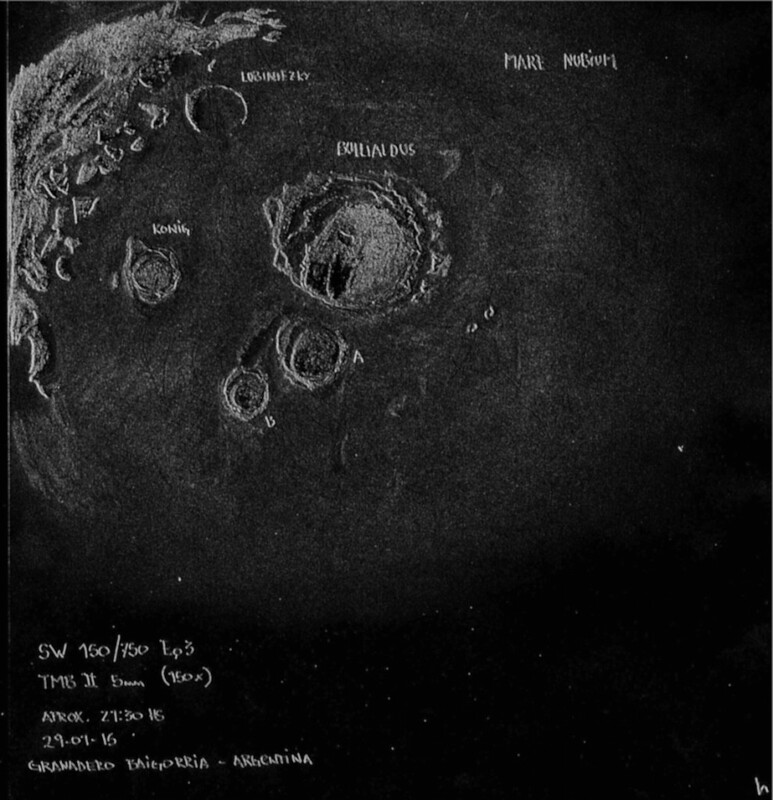 The drawing was done with paper and pencil, then processed in Photoshop to invert the colors and simulate the glow effect generated by the moon in the sky. 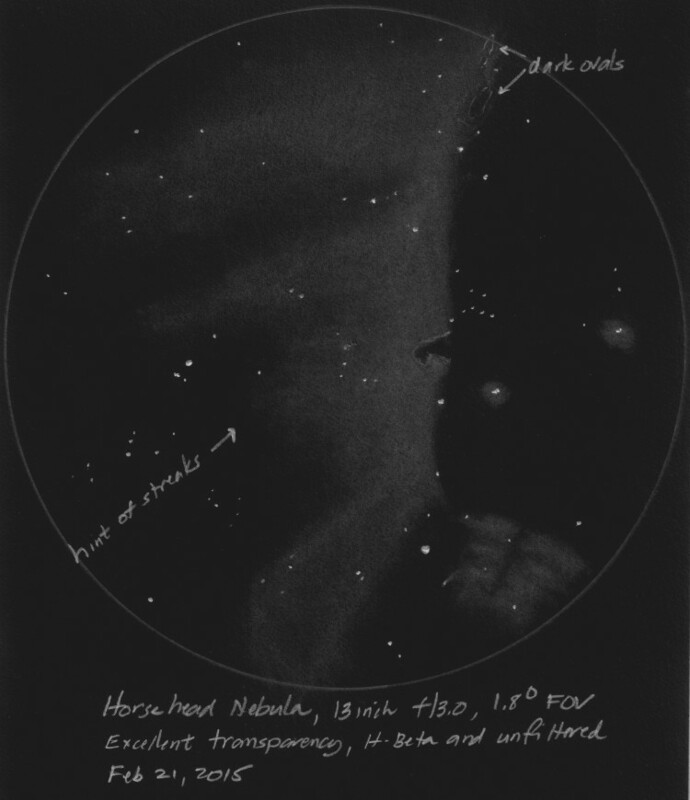 Also I added some color to the stars, as I see through the eyepiece (huygens 25mm), but the colors are dimmed a little by fusing a celestial layer to set the tone of moonlight in the background. Actually should be blue and red brighter central star. 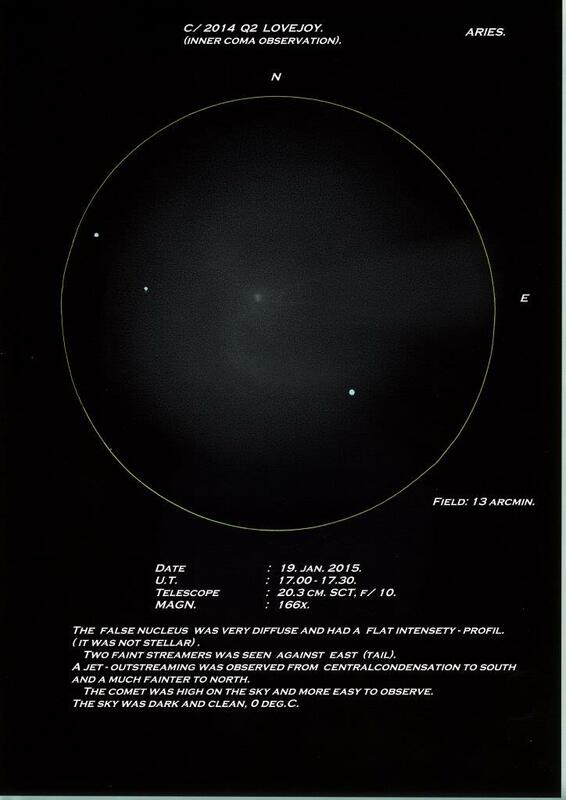 The team I used to do the sketch is a reflector telescope Helios brand, 114mm aperture and 900mm focal length. The drawing was made from Parchment, Buenos Aires. The object is NGC 3293, an open cluster in Carina, quite a bright cluster, and certainly beautiful. It was done using graphite pencil, white paper and Photoshop. I liked the result, so I hope you enjoy it! Media: HB, 2H, 3H. pencil rubber, color pastels, Photoshop. 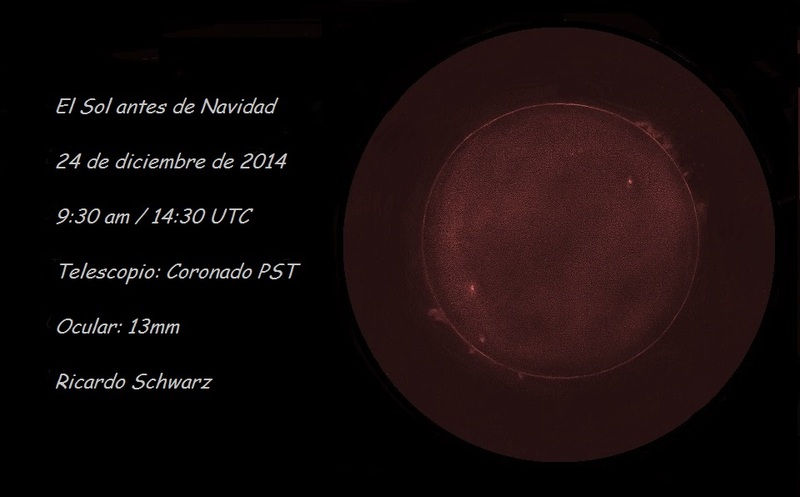 Eyepiece: Explore Scientific 14mm 82º (107x). 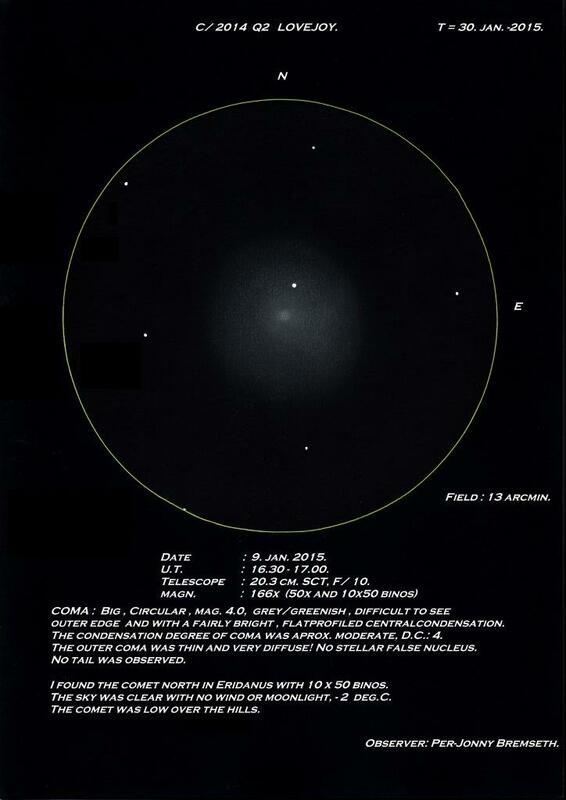 Conditions: Poor seeing, heavy light pollution. Observations: Young and compact open cluster in Carina. 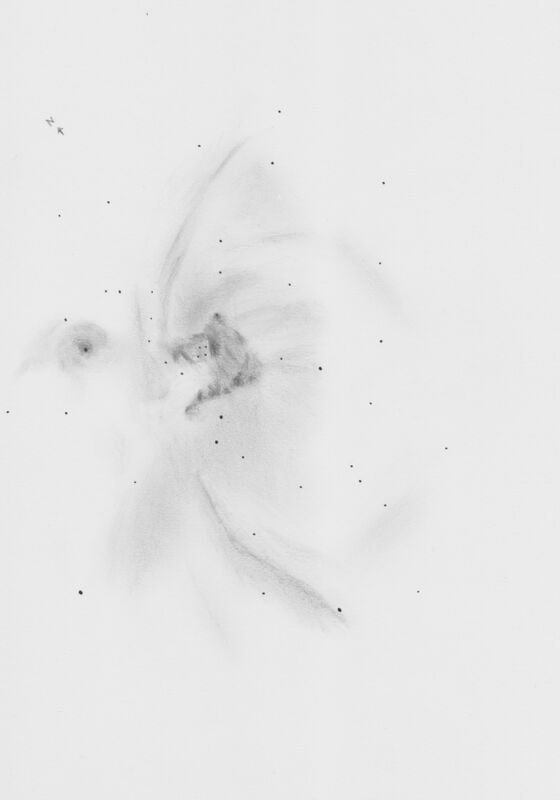 Lots of unresolved double stars. I send you sketches of an early outburst on comet Hale-Bopp! The observations show the outburst and the expanding dust in the coma! This is three old sketches, but I hope you enjoy them! Read my info on the sketch, please! 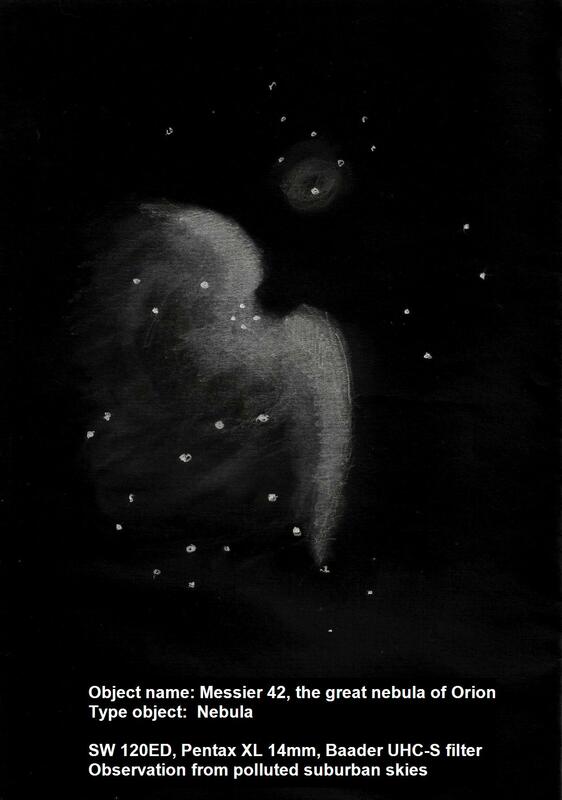 I used pencil on white paper and inverted. Thank you for comments Frank and also others!!! Best wishes and clear skies to all ! 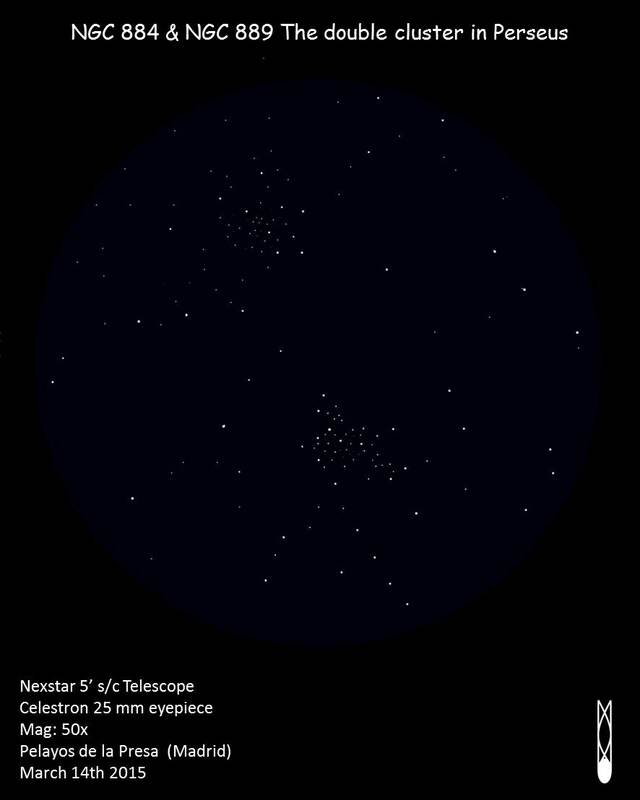 Conditions: Clear sky with no moon, seeing 2/3, Bortle 5, Constellation above 60 degrees over the horizon. Hi Asod! This is my first astronomic sketch of a planet. I decided to represent Juppiter because I love its moons and their positions, expecially last night, when I realized this sketch. 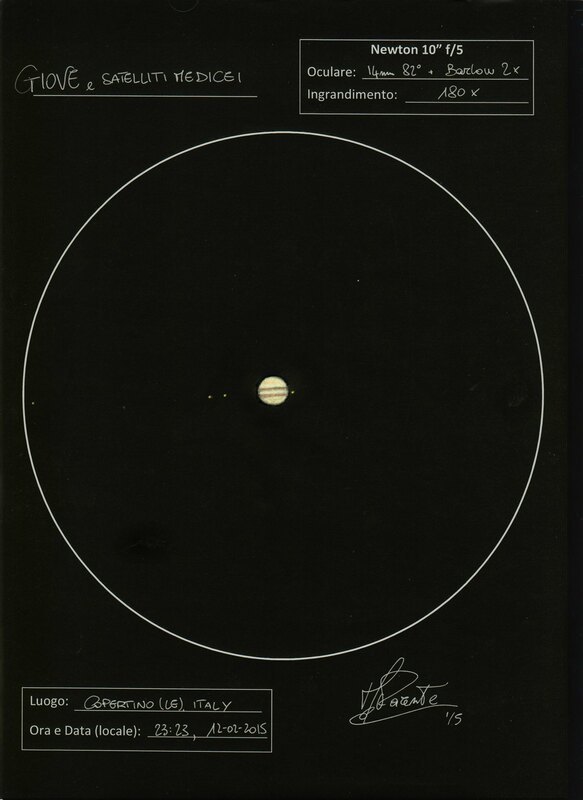 From left to right: Callisto, Io, Ganimede, JUPITER, Europa. 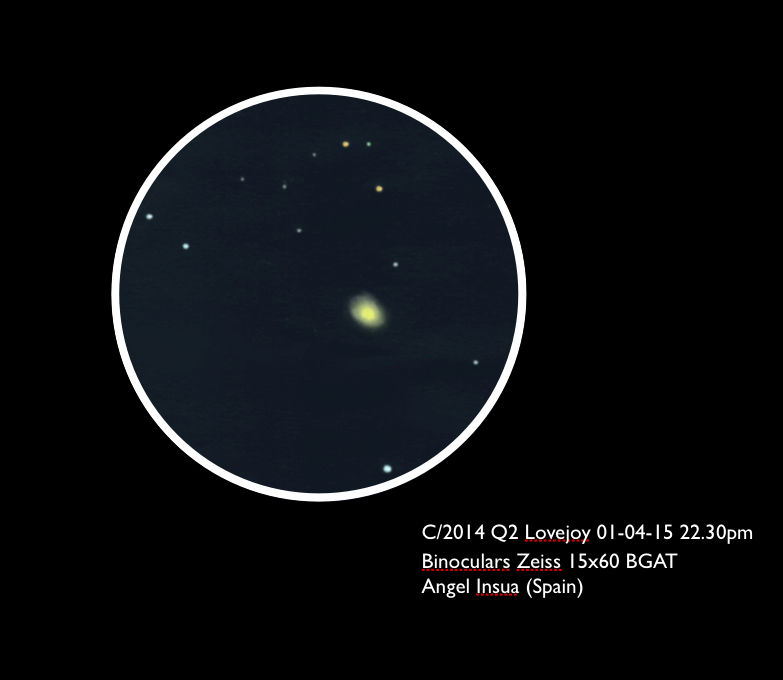 I observed it with my dobsonian telescope 10″ f/5 using a 14mm 82° eyepiece. I realized the sketch with pencils on white paper, then inverted. It’s a triple sketch, staring Minkar, Regulus and Mimosa (from left to right), all of them stars. Location: La Matanza, Buenos Aires, Argentina. Media: Graphite pencil, white paper, Photoshop. 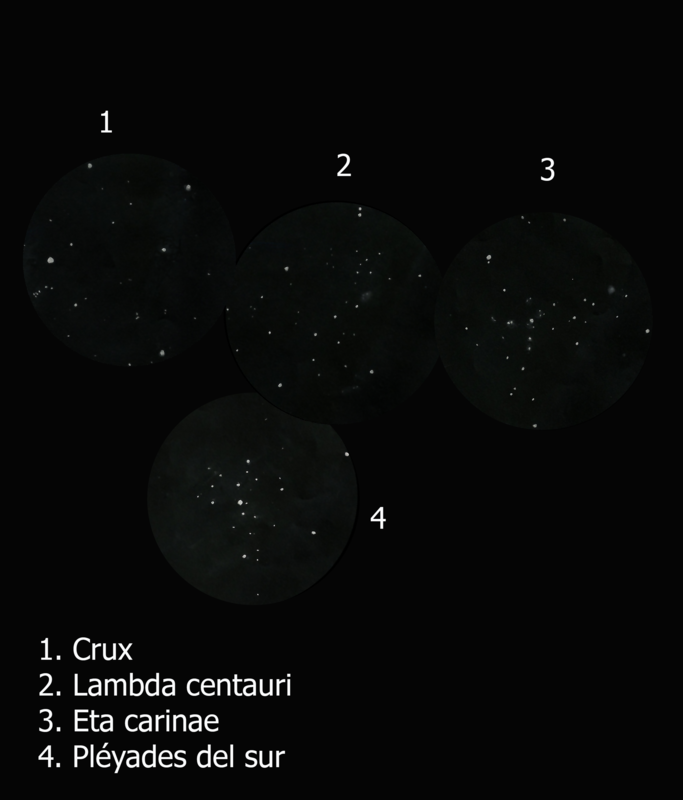 Seeing didn’t help at all, but anyway, it took me a while to finish the sketchs; the original idea was to draw at least six different stars from different constellations, but right after finishing Regulus, clouds came out to stop my work. As a result, these are the three sketched stars. Hope you enjoy it! Location: San Miguel, Buenos Aires, Argentina. Media: 2B, 2H, HB, blend and PS. 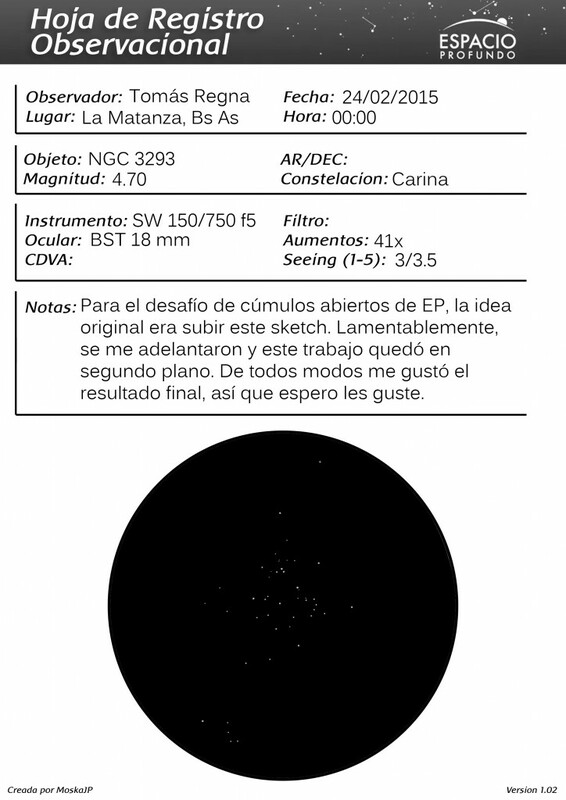 Eyepiece: BST Explorer 18mm (x84) . 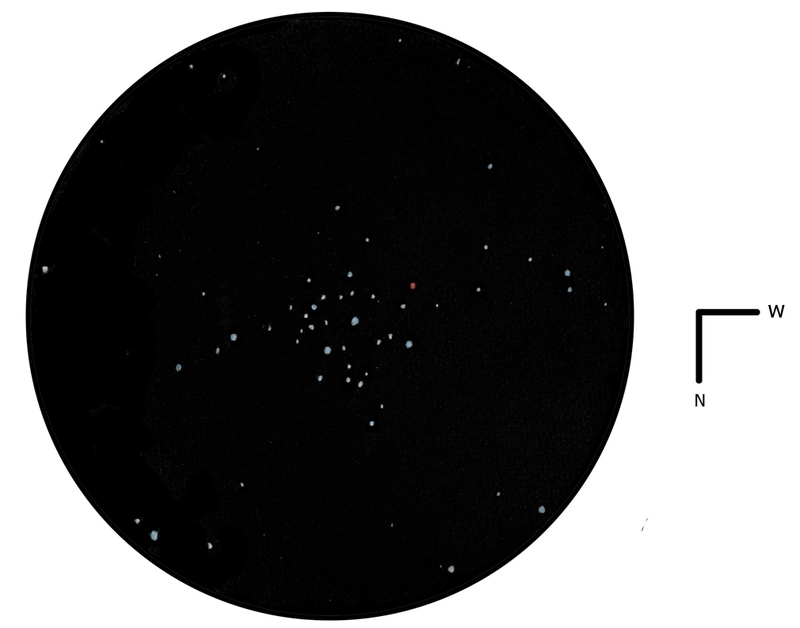 One of the best open clusters of the sky and my all time favorite! 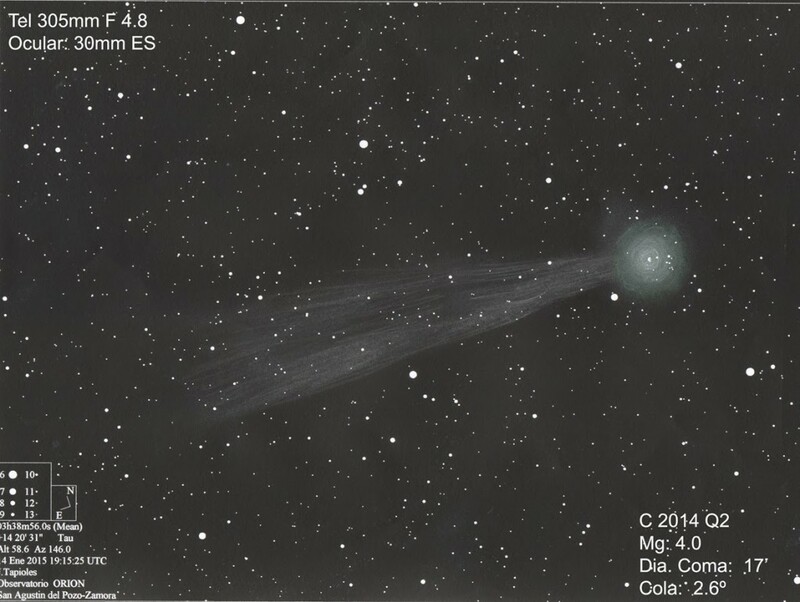 C / 2014 Q2 (Lovejoy) – Beautiful Comet! 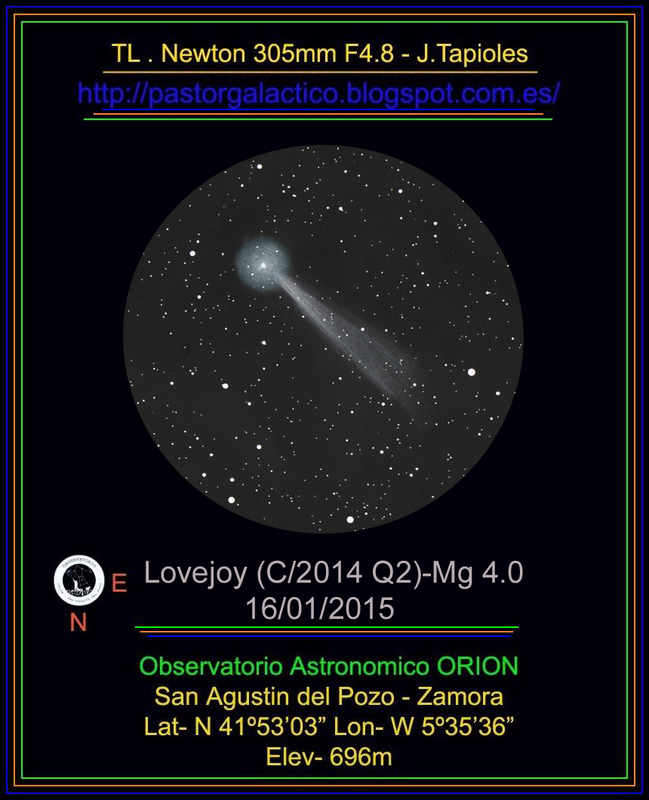 Object Name: C / 2014 Q2 Lovejoy- beautiful comet! There was suburban, slightly hazy sky, although it was clear enough, stabilized by frosty atmosphere. My Vixen showed also almost visible beam which climbed up. 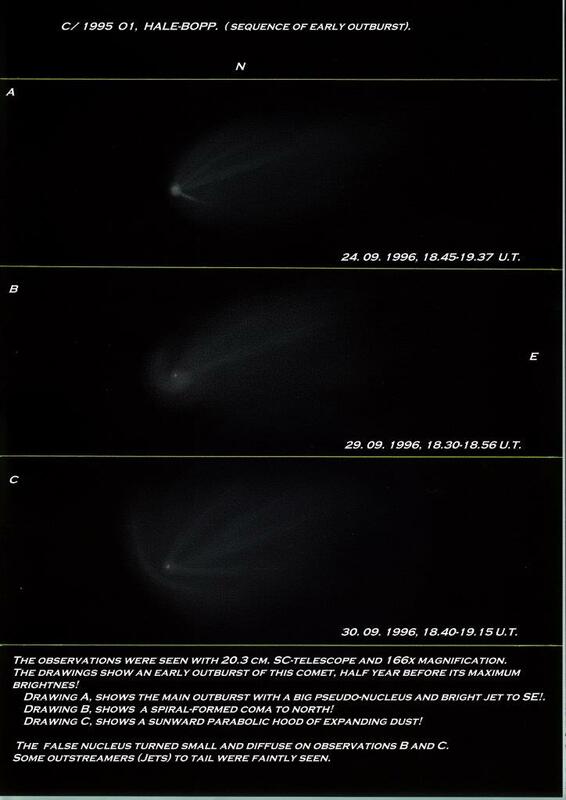 This jet (tail of the comet) was extremely faint and diffuse, shooting up like a geyser! 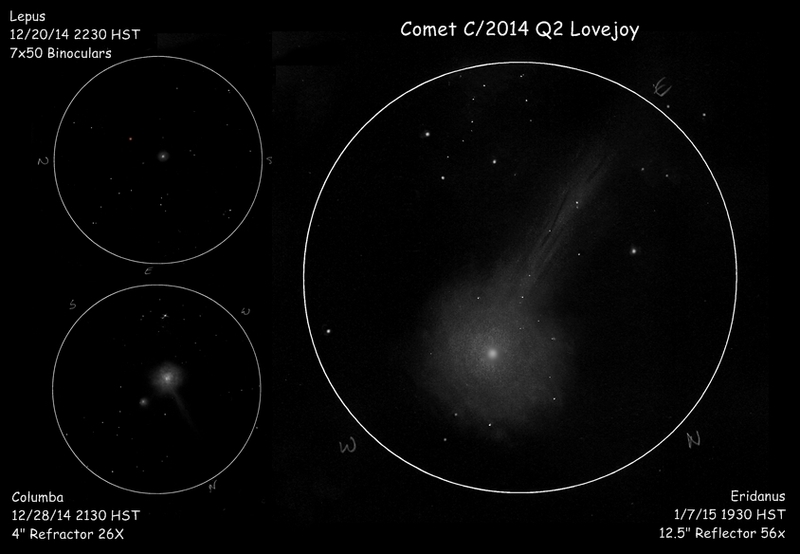 I encourage you to observe C / 2014 Q2 Lovejoy-beautiful comet! 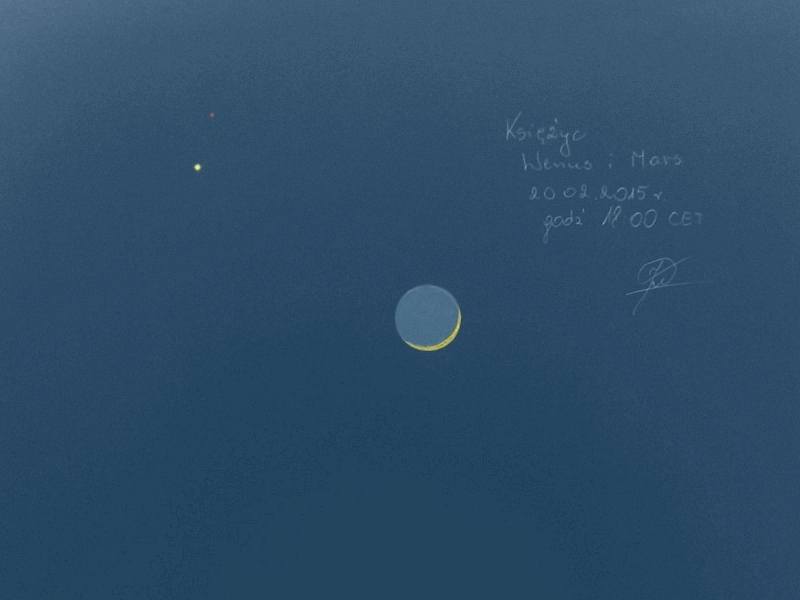 This is my latest sketch conjunction of Venus and Mars. 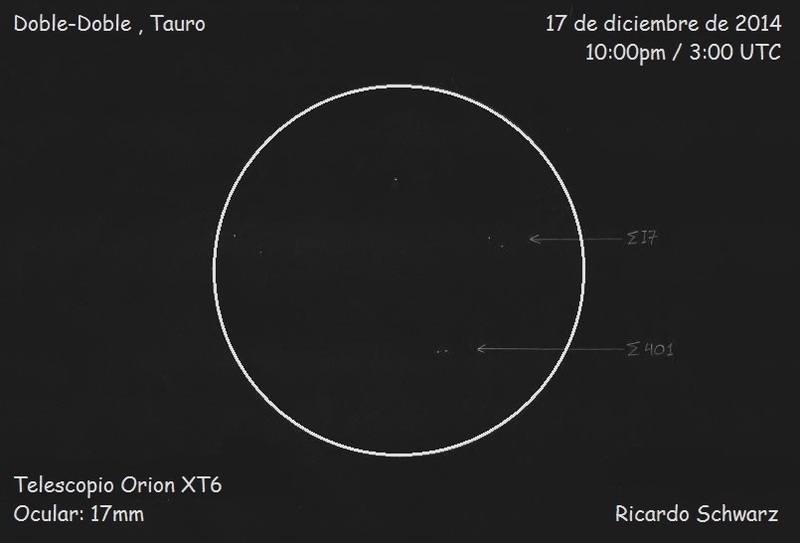 The planet was near the moon, one day after the new moon. You can see the moon was light gray. When sketching, the sky was clear, visibility was very good, light wind was blowing. Once again I had the opportunity to use the fast (3.3) 24″ reflector made by Olivier Planchon. The EP used is a 2″, 31mm Nagler. 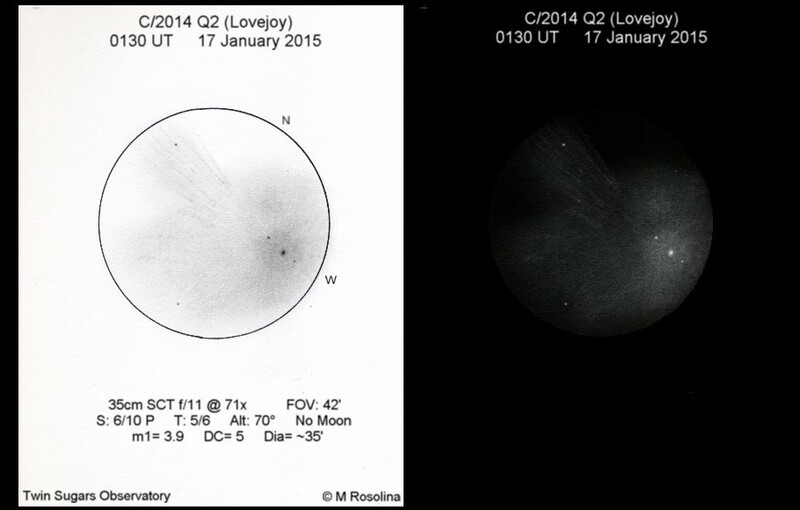 The C2014/Q2 Lovejoy comet fades out on its way back. In the same FOV we can see M76 a planetary nebulae. 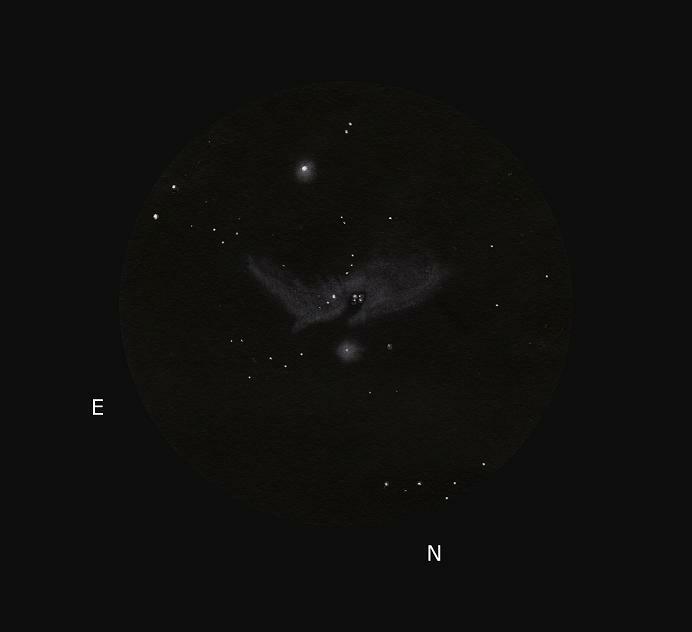 The NGC number is double because when discovered people suspected that this was a double nebulae (NGC 650 & NGC 651). 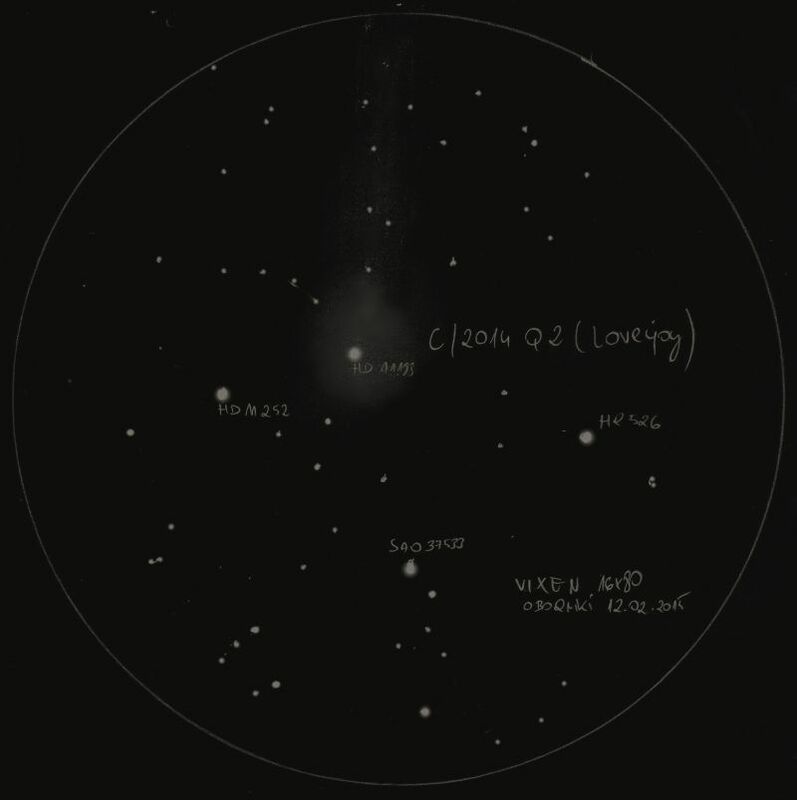 The distance of M76 is still unknown. 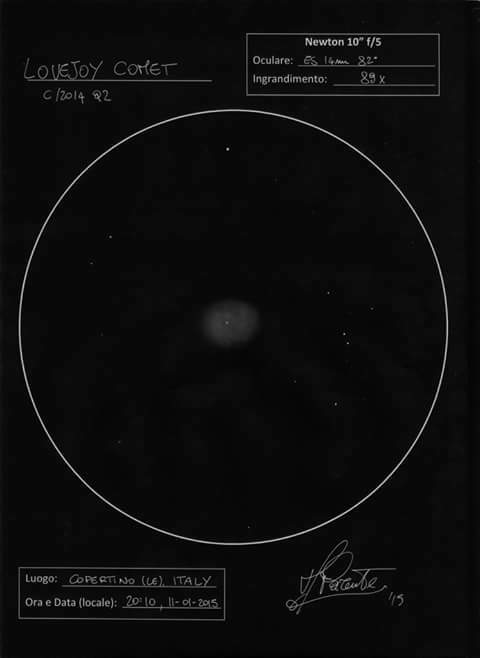 During our 1 hour session we were able to observe the displacement of the proto-nucleus facing a nice m= 8.7 K5 red star, SAO 22504. The separation was here only 1’. To make this small gif animation I made 7 sketches to indicate the relative positions. The light of this star takes 1400 years through the coma to reach our planet while the light takes only 10 minutes from Lovejoy to us. That was a nice double rendez-vous! Clear sky to you all! 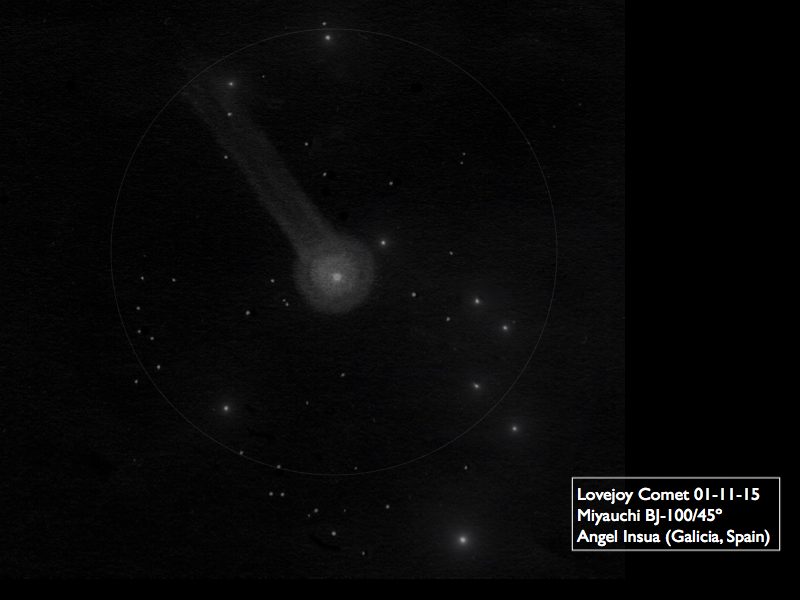 This is my last drawing of Lovejoy comet. the comet shows an intense light and his tail extends beyond the field of view, being weaker and looking better by moving the binoculars. 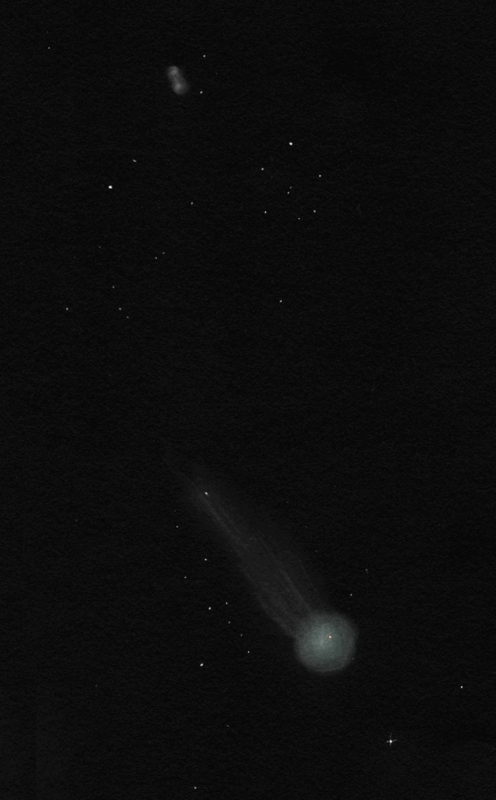 the background of stars and the comet give a lovely image. 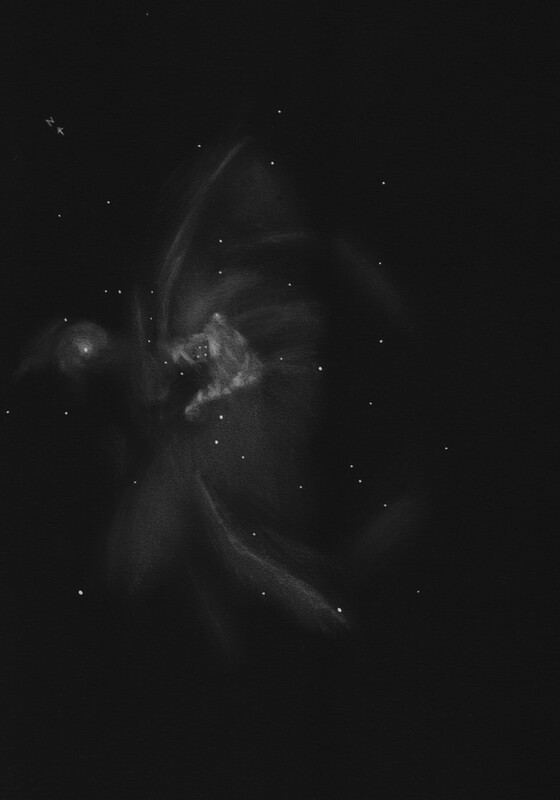 This sketch show the inner coma seen in 166x magnification! The false nucleus was diffus and had a flat intensityprofil (not stellar). An outstream from nucleus to south was observed and a fainter to north. 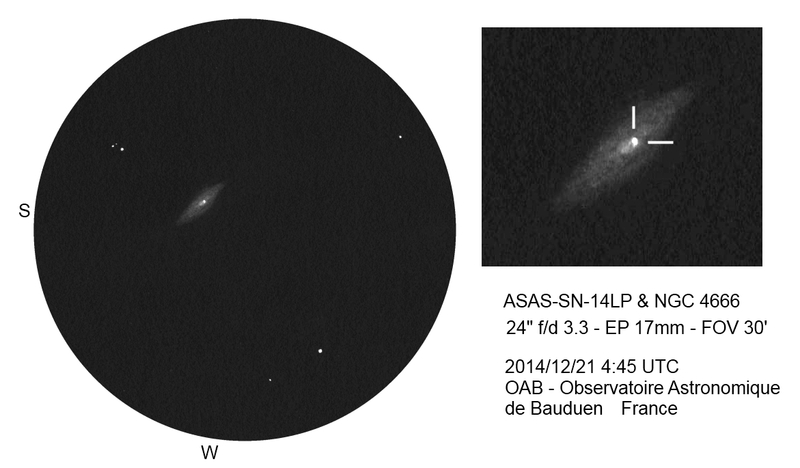 Two faint streamers was seen to east (tail). long tail. The dia. of coma was estimated to 18 arcmin. The coma was grey, D.C. : 4, Mag. : 4.2. 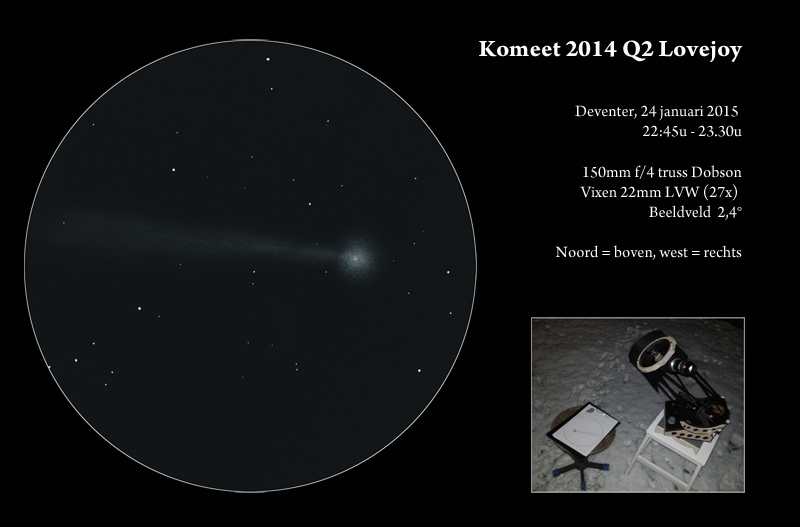 This time the comet was high on the sky, and easy to observe! 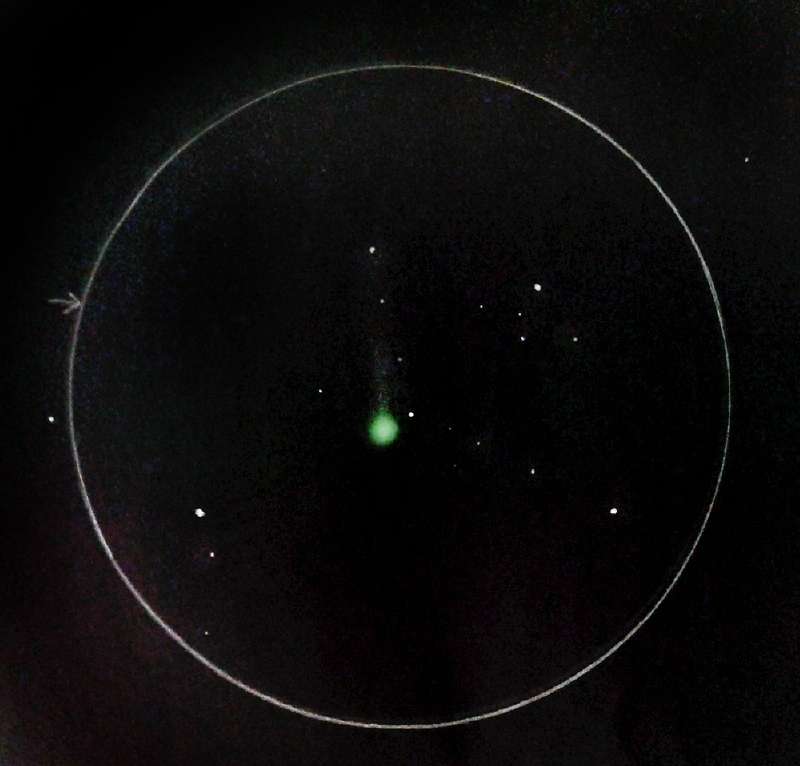 I made a sketch of comet Lovejoy through my 150mm f/4 Dobsonian. At first sight I couldn’t spot the tail, but as my eyes became more and more dark adapted, a faint tail began to grow larger and larger. 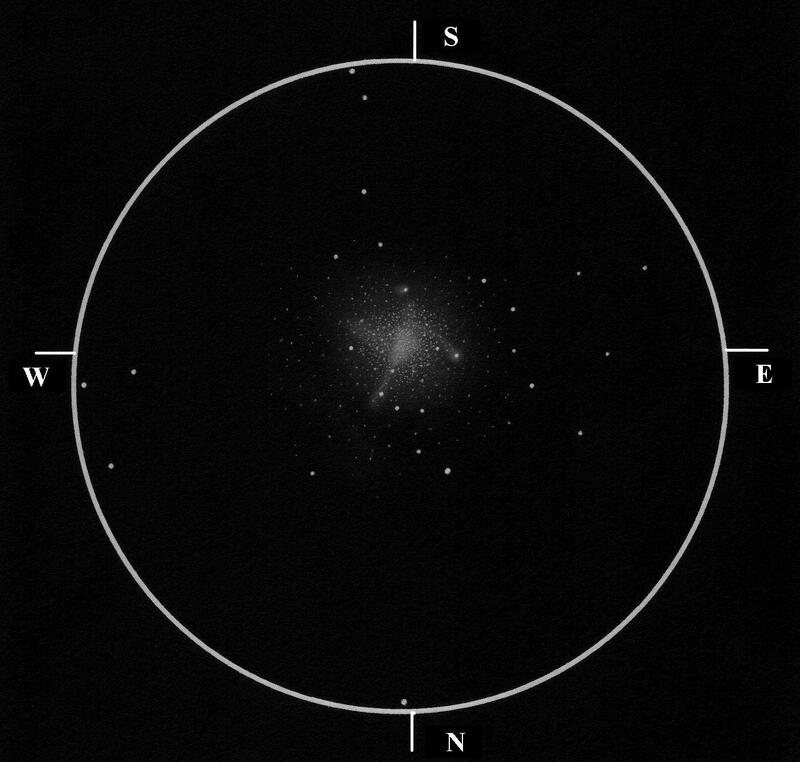 It remained faint but the shape was well visible: quite narrow, slightly brighter near the coma, and gradually widening towards the east. Unfortunately I did not detect the greenish color some reported. In the sketch north is up, east is left.